So I was working on my Necrons for the first time since I "finished" the army for tournament play over a decade ago. The codex is completely new, the background has been completely changed, re-written and made into a better codex than the lifeless and depressing codex of the prior Necron existance. 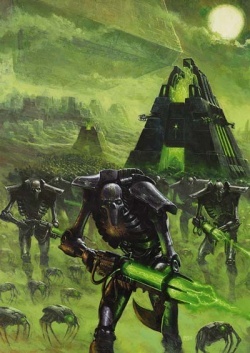 For once you can run the Necrons and feel pride in knowing that you are commanding a force which is not the soulless automaton puppets of the god-like C'Tan, but an immoral metal army of evolved Baboons. 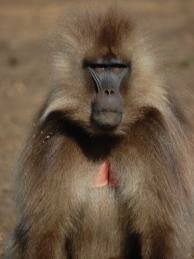 Yes, you heard it here first - the Necrons are immortal metal monkeys evolved from Baboons - Planet of the Apes - no sir - full fleged Baboons without any hair, and evolved into one of the most voracious, vindictive, and warlike races the Universe has ever known - throwing themselves into war with those who may or may not have created the Universe! Above you can see the two photos side by side for comparison of the facial characteristics. I found it interesting that even GW finds inspiration in nature for the source of their models. Nice work GW and thanks to some inventive detective work - I think I have solved one of the mysteries of the inner workings of GW - they are fans of Animal Planet! 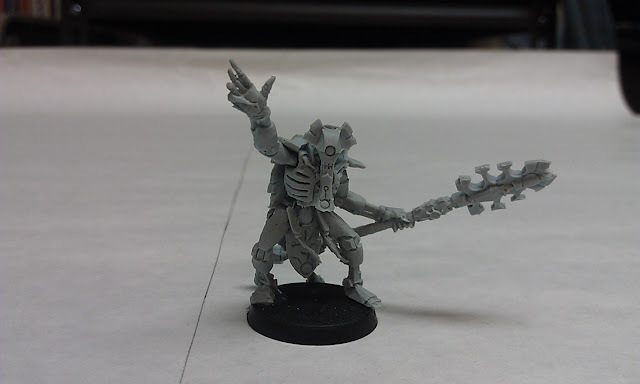 Alright, alright, enough with the humor and back to the task at hand - Conversions! 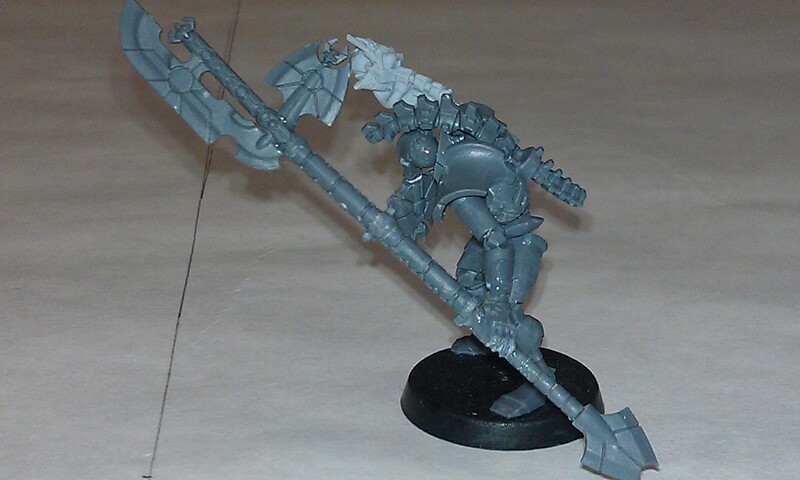 First things first - why would one need to do conversions of a completely new line of models? Well, because they have not released the Royal Court - and they are some of the cooler ideas to use in the new army and the selection of models is "limited" to say the least. 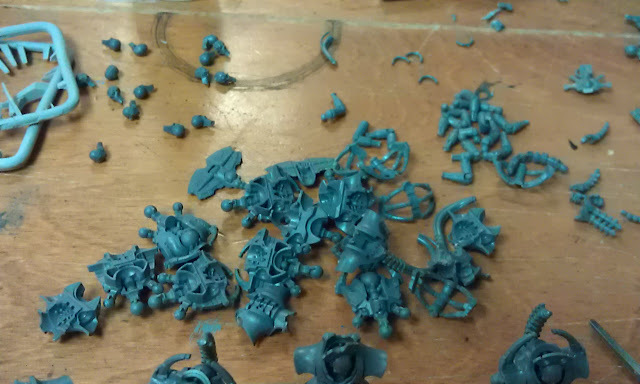 First, to get a new Necron Lord or Overlord you have two options - purchase a Fine Cast Necron Overlord - see the prior post to view the model - not bad, but it has issues - the mold lines are not crisp and the cost is - huge for the model. Also, there is ONE pose - unless you want to field the special character models, which is also fine - again they are Fine Cast and that is a whole new level of PITA to deal with - and they are of limited battlefield use because they are fragile - and clumsy opponents will destroy them! 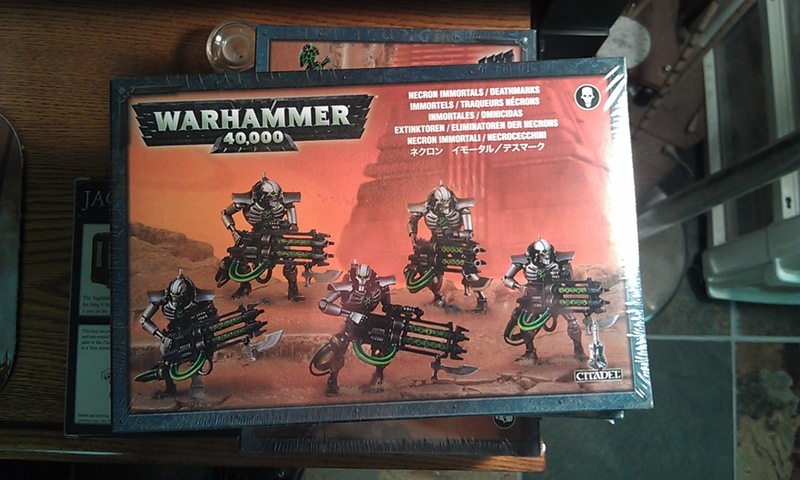 The other option to get these new lords is the Necron Catacomb Command Barge - of which you can field exactly TWO of them unless you convert them to the Annihilation Barge in which case you could field 5 - by who would want to do that just to get the five models you want and again they are limited to ONE pose? So, for the Royal Court - it was conversion time here at Robertson's Rules of Disorder. Here are photos of the original Fine Cast Cryptech model - not a bad model - but plagued by the issues which plague all Fine Cast models - air bubbles, imperfections and the slap-happy crank'em out get them into stores production which does not bode well for a modeling process which requires precision to get the best and most reliable cast of models. That said - they are also really expensive and fragile. Did I mention they are fragile? Oh, well, you will find out when you purchase one what I am talking about first hand the minute some kid picks it up and does the "opps!" with the figure and you are bemoaning the hours you will spend putting Humpty Dumpty back together again. Alright - enough already - one with the photos! Here is a photo of the assembled Cryptech model - very nice model - but poor casting and plenty of defects if you look closely at the model or zoom in on the photo. The distinguishing characteristic of the Cryptech is their incredibly developed chin. Obviously evolved after centuries of sitting in their "thinking chair" on how to bend the very streams of time, matter, and energy to their will. As you can see the Staff or Rod of the Cryptech is distinct from those of the other models like the Warscythe and Rod of the Covenant in the standard boxed units. However, it is not so distinct that you can't convert something cool. Further the new background gives you several new types of Cryptech to field - and each of them has a distinct staff. So, plenty of modeling fun for everyone. Another view of the Cryptech from Fine Cast - if you look closely you can see the magical bendy staff of super power as it bends in four or five directions over the short course of it's length. I've attempted mechanical straightening of the material and it has been ineffective. I fear that the heat gun and ice bath method will be the only viable solution - and that is also a very risky technique and not for the faint of heart. Some have success with a hot water bath - I have had limited success with it. It may be worth a shot before I break out the heat gun. 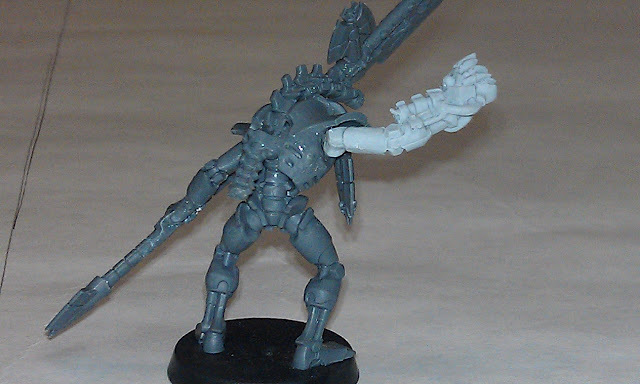 Below is another shot of the Cryptech using one of the two arms provided in the kit. The chin is even MORE distinct in this view of the profile of this model - talk about remaining silent - you would nearly have to talk in short sentences to prevent yourself from wearing out your jaw muscles - fortunately these guys are immortal metal machines with sythesized voices and a speaker box. 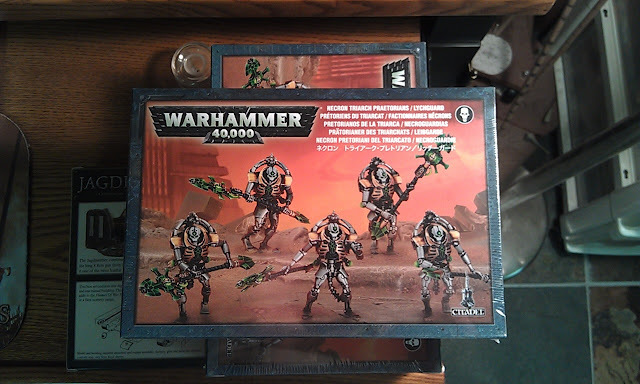 So here is where we start with the conversion pieces - two different boxed sets of the new models. 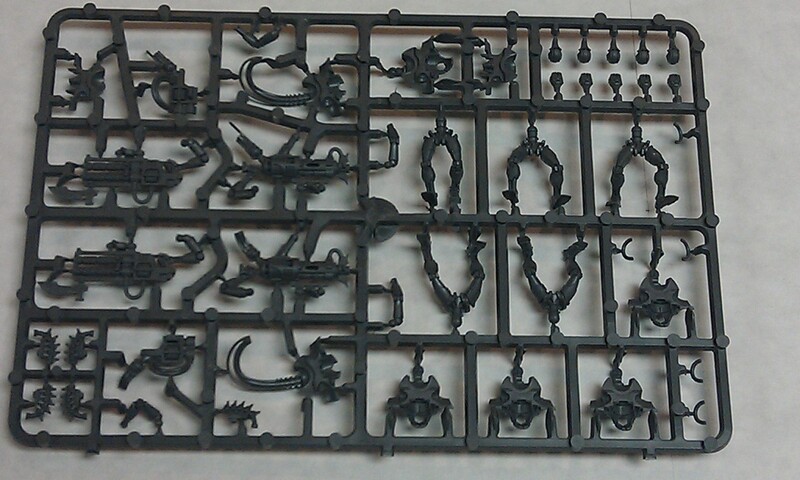 Above we have the Lychguard/Triarch Praetorian box with their sprues, and below we have the sprue which will be mainly used from the Immortals/Deathmark box. That is a ton of bits - there are two backs for each type of model in each box - so you have 20 backs to work with - unfortunately they are NOT compatible with each other - so you have to keep the front plates and back plates separated or be prepared to do some modifications of these bits to make them fit together. 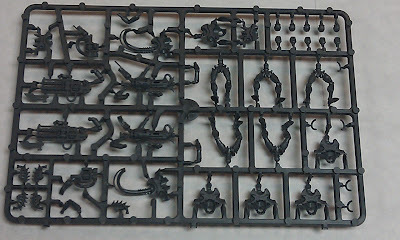 I believe Green Stuff - or in my case Apoxie Sculpt will be necessary to smooth out any conversions here - so I decide to forgo that option because I don't want to spend an inordinate amount of time on each model - I am NOT going for Golden Daemon with these figures - they are for table top gaming. If you are looking at this blog thinking you are going to see "Golden Daemon" work - move along - that way leads to the - wait - these are not the droids you're looking for - move along. 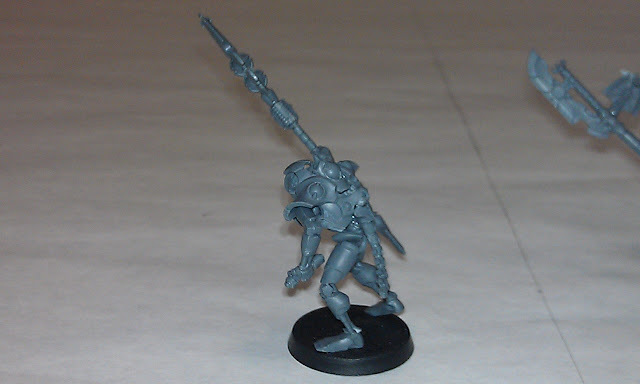 The first conversion - a simple bend of the torso gets you the bent and contorted look of the original Cryptech model and you add in a nice staff conversion - and a few modifications to the back and arms, and you have a passable Cryptech which doesn't take too much time to complete and it is fairly simple to do with a standard hobby knife and patience. Cutting and gluing bits together is tougher than it looks if you don't use the right tools. Sharp knifes (new blades) work best. Have a dedicated cutting surface - not your mother's table - I have my own table and I can do to it what I want - then again I am employed and can afford to stay in this hobby and expose my kids to it too! 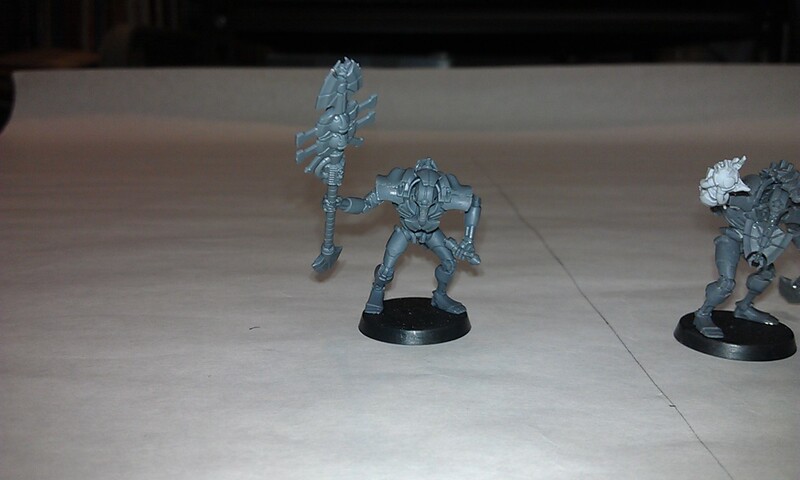 In looking at this model (the one center) you can see that I used the Deathmark head and added a tip from a Warscythe/Rod of the Covenant to his chin - giving him a stylized beard to give him the "huge chin" look of the other Cryptech - I prefer my conversion over the original, then again, I am biased. 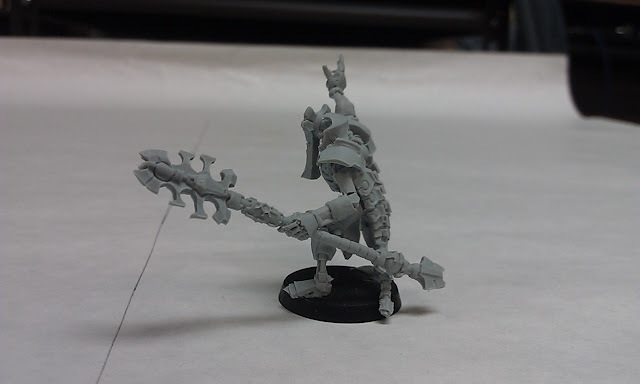 The staff is a conversion of two staff heads cut up and spliced together to give you an extra set of "arms" in the center section. It fit together nicely! Here is a close up of the second coversion. 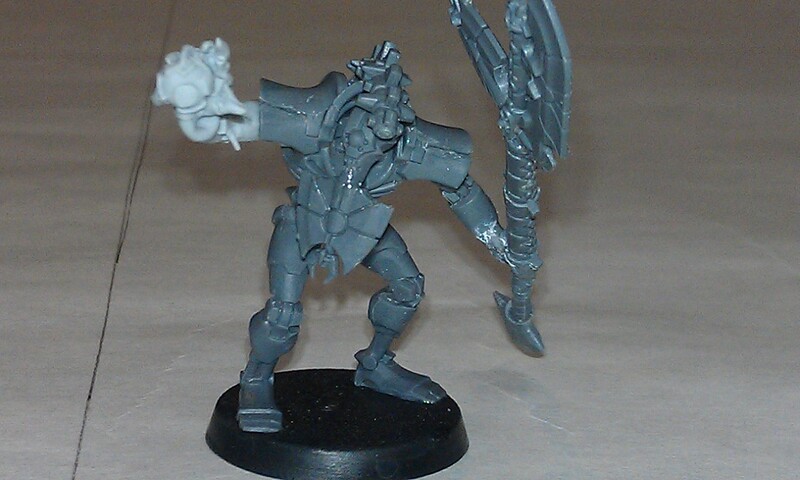 I've used the Cryptech hand from the original model (the package gives you two arms - you have to pick one) and it looks pretty good on this guy. His staff is a bit more complex than the other staff. It is cobbled together from three sources. First, the longest part of the staff are barrels from the Immortal Gauss weapon - they were cut out - spliced together through drilling a hole in them and inserting brass rod inside. The head of the weapon is a blade from the Lychguard model which is typically used with the large shield. The head also features a spliced on part of a Warscythe and the lower portion of the staff is all part of the original Warscythe/Rod of the Covenant, but it is spliced together and held together with brass rod by drilling through the center sections of the rod and then splicing the whole thing together - much like beading - only using brass rod and plastic bits you had to core with a drill yourself. The glossy sheen on the model and the white areas are glue cure effects which will be cleaned up before priming. The white part is accelerator on the wrist joint. A back view of the second model - I've yet to attach the "tail" on the monkey. I added it shortly after I looked at this photo and before I wrote this part of the blog. I will give you an updated photo later after he is primed and ready for paint! 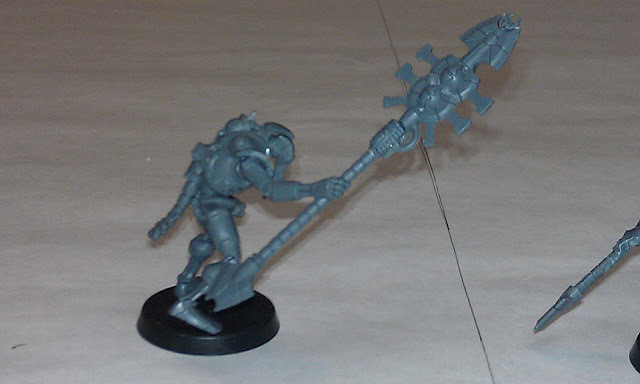 A side view of the first model - you can clearly see the size of this Staff/Scythe/Rod and the extra large head on the staff - makes it interesting and fun - you can clearly see the tail on this model. You can also just glimpse the work on the back of this model. 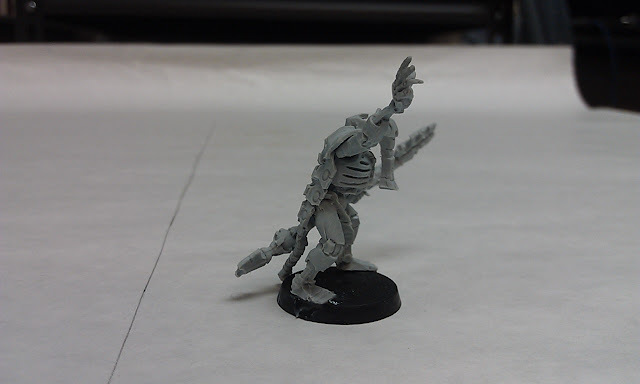 I filled in a gap with various bits rather than the standard "spinal column" found on other models. A side view of the second conversion showing the staff/rod/scythe for your thoughts and the modifications of the spinal column on this model to give him the hooded look similar to the original Cryptech, but with a different vision of how it might look - and to give each member of my Royal Court some personality! A decent shot of the rear of the first model - you can see the ball on the top of the back - this comes from the shield model from the Triarch Praetorian model cut down and filed to fit in place and then a section of spinal column has been cut to fill the gap and attach to the back of the head of the model. It looks pretty darn good and It will look very nice when I get the final bits and work done on it. Well, enough of this for tonight - enjoy and post comments below! Turn 2 and it was nearly time! Valentines Day Massacre - Tunisia!